tutorial|How to Clean iPhone Garbage Using 3uTools? Some Apple users may meet the problem that iPhone runs more and more slowly. In addition, they can find a lot of useless garbage in their iDevices, and these garbage occupy memory and storage. Do you want to improve the running speed of your iDevice? This tutorial is mainly about how to clean iPhone’s garbage using 3uTool, after you do the following operations, your iPhone will run faster. 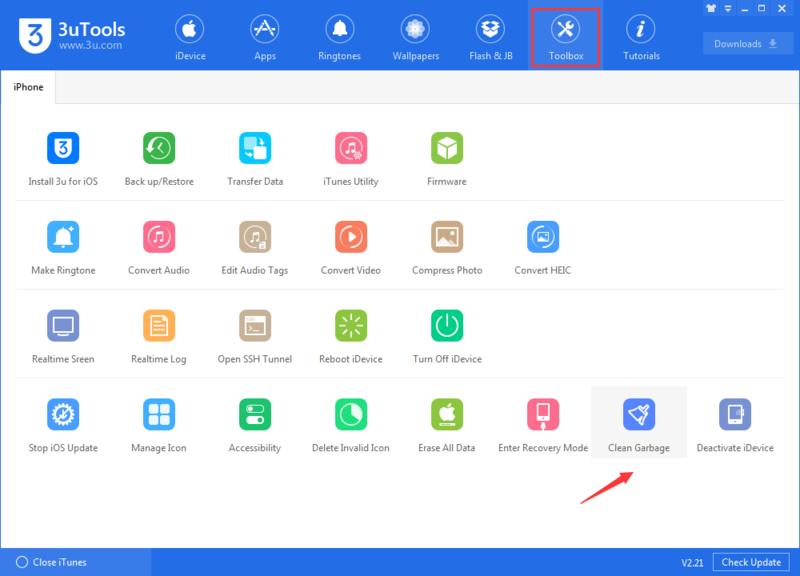 3uTools is unable to clean app’s trashes on unjailbroken iDevices above iOS 8.3. 3uTools can not clean Cydia cache. Step 1 Please make sure that you have downloaded and installed the latest 3uTools on your PC. Connect your iPhone to PC using the USB cable. Step 2 Click “Toolbox”→ then click “ Garbage Cleaner”. Step 3 You just need to choose the items you want to clean and click “Clean”. Step 4: Please wait until this process is completed, and your iPhone will reboot after this operation.